Floral mesh wrap with the solid color is used to create an elegant and attractive look. It is one of the first decorative things for a special occurrence, for home interior designs and creates stylish gift wrap. 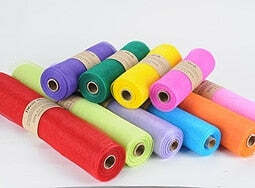 At bbcrafts.com, our floral mesh comes in all ranges of colors and patterns at very reasonable price. We provide our floral mesh that is available in both metallic and solid colors. These beautiful decorative wraps are perfect for creating a smooth, seamless and stunning wedding decoration; designing reception tables, table top decorations, columns, and seats. Choose your combination of spring or autumn collections. The ethnic and party bridal look is made with our stylish two color design floral mesh. By using a floral mesh wrap solid color, you can quickly turn ordinary and everyday items into beautiful works of art. Premium quality floral mesh, made with finest materials! Roses are some of the most beautiful flowers on earth, and there is nothing more graceful than a rose when it is wrapped in floral mesh wrap solid color that simply adds the beauty. The opportunities are endless with these amazing and sophisticated pieces of the decorative item. Available at cost-effective rates with fast and reliable shipping service!